Baltimore Pride 2017, dubbed “Pride Unleashed,” will culminate this weekend with the parade and block party on Saturday in the Station North area and on Sunday with the festival in Druid Hill Park. Baltimore Pride, which originated in 1975, is run by the GLBT Community Center of Baltimore and Central Maryland (GLCCB). A plethora of events and parties have already taken place during “Pride Week” that began on June 9, such as a Pride Bar Crawl, Feeding the Homeless Community Outreach, King & Queen of Pride Revue, Remembering the Pulse victims vigil, Pride Interfaith Celebration, Queer People of Color Party, a GLCCB open house, the mayor’s reception at City Hall, Twilight on the Terrace fundraiser and many others. This year, the parade on Saturday will not terminate in the Mount Vernon neighborhood as had been the tradition but instead will wind up in the Station North area. It will originate at Charles and Eager streets, and the parade, billed as the longest ever in terms of distance and the number of contingents participating, will proceed north on Charles Street beginning at 2 p.m., traverse North Avenue and end up at 22nd Street. 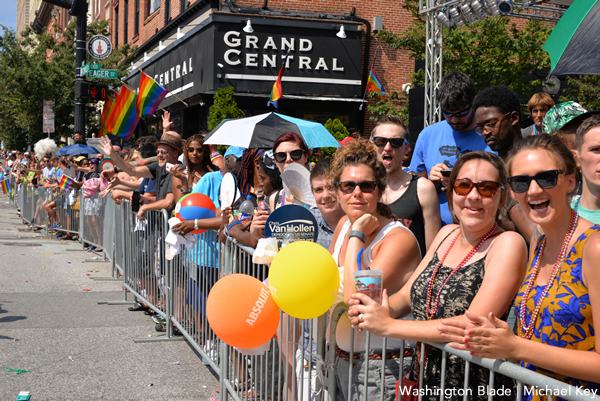 Prior to the parade at 12:30 p.m., there will be a “pre-Pride extravaganza show” at City Stage (Charles St. and North Ave.) followed by the traditional High Heel Race at the same locale. The popular block party that will run from 4-10 p.m. has similarly moved from Mount Vernon. Its footprint is located between 23rd Street on the north (where the Main Stage will be situated at Charles Street) and North Avenue on the south. Morton Street forms the western boundary and St. Paul Street is on the east. Charles Street runs up the center of the footprint. In addition, there will be a Youth Zone within the area for those between ages 14 and 20 with its own set of entertainers, such as Bunns of Steele, Summer Heights, Damon, Positive Voices and Keyayshia among others. This year’s block party headliner is Big Freedia, a New Orleans-based rapper and ambassador of Bounce music, known as the Queen of Bounce. Big Freedia is scheduled to perform on the main stage at 9 p.m.
Other scheduled performers include King of Pride, Miss MD P.O.A., Azra, Tara Evans, a show from the Baltimore Eagle’s Nest, Jessica Sutter, Tan Estintric Odom, Coco Wilson, Queen of Pride, George Lovett and more. On the Dance Stage, scheduled performers are Life on Planets, Carolyn Victorian & DJ Oji, DJ Pope, FAQ, Malphunction, and The OGS. There will also be special parties that night at local gay bars including the Baltimore Eagle, G•A•Y Lounge, Flavor, Grand Central, Leon’s/Steampunk and The Drinkery. The Sunday festival at Druid Hill Park is typically more subdued than the block party and welcoming to families with its Family Zone. An innovation this year is an Elder Tent for older LGBT folks and allies to hang out. Visitors will meander through the festival visiting a multitude of vendors representing shops, organizations and political groups as well as enjoying the food and beverages. Pride-goers sit on grassy areas at various locations to soak up the entertainment on the Main Stage, the Dance Stage, and the Lady Lisa Drag Stage that features local drag performers. Some of the performers include Girl Named Chuck, Pretty Boi Drag, Moo Jack, Rue Pratt, Black Asset, Ultra Nate as well as DJ Deezy, DJ Alex Funk, DJ Figment, DJ Powerline and DJ Cover.